Merchandising in tandem with games has a better history than one or the other. 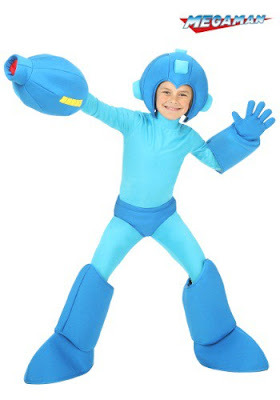 As close as to the real life Bad box art Mega Man as you can get! The kid actually looks good in that costume! The adult... er... not so much. From the look on his face, I think he knows it. Which one am I talking about? You decide. At least for the dark blue parts have some thick plastic or something, the close quarter tights are too strong here GOT DANGGIT! As it stands these are just wet suits/scuba gear with a cheap Mega Man twist. 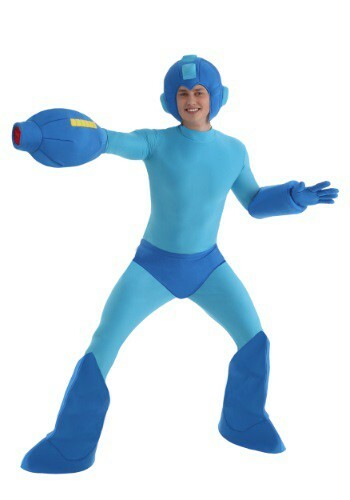 Guys, why bother with a new Mega Man game when you can literally become one? Buy this, wear it, treat your city as Symphony City and go Mega Buster everyone on the streets (You just got yourself a live action and Mega Man 11 fixes :p). Is this even an official piece of merchandise that Capcom licensed? A lot of Halloween costume websites and stores make costumes based on fictional characters. I see Pokemon and Mario costumes all the time each year, among others. This could just be something the retailer made themselves. You know, I know Mega Man's eyes are huge in the classic Keiji art style, but I never realize how tiny human eyes are in till seeing them in comparison with Mega Man's helmet. In my opinion X8 humanoid eyes are the smallest eyes can get while still looking good with traditional Mega Man helmets. I'm just going to patiently wait for the Roll costume(s?). The photos for it are sure to be priceless! But Roll just has a regular design.... A little girl or a woman wearing Roll's clothes would just look like they were wearing as close as possible to a plain old regular dress. The only part that would be weird would be the shoes I guess. Then again that is my opinion looking from the outside, I am not a female. Unless it is Mega Man 8 Roll, or EXE or Legends or Universe...or Legends 3. Bored custome. I will pass. Does anyone have any idea if the buster is attached or if it comes off?